TV | J.W. 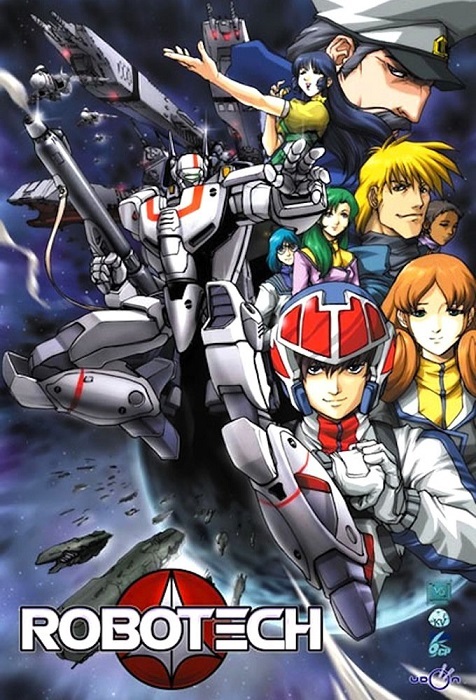 Wartick -"Always Have a Reason"
Robotech was one of the first anime programs to be released in the United States, in 1985. So I’m a little late to the party to finally be watching it, but I always wanted to when I was little, and my wife got me the series for Christmas a year ago. I was surprised by the depth of some of the worldview-level issues that were addressed in the show alongside a story of aliens vs. humans. Here, I will examine some of these worldview issues from the show from a Christian perspective. There will be SPOILERS in what follows. One of the characters who shows up later on in the show is Lynn Kyle, is a pacifist. He believes that the army is repugnant, at best, and harbors a deep detestation for military personnel. Yet the story Robotech tells is one in which an alien race is bent on wiping out humanity. Is pacifism a moral choice in the face of annihilation? I can’t help but think of Dietrich Bonhoeffer when I think of situations like this. Staying silent in the face of injustice is itself an act. To stand aside and let others defend oneself while there is a whole people bent on xenocide is itself an ethical decision which seems to have moral implications. I would argue those implications show that such inaction is injustice, and this is a theme found throughout Christian theology from around the time of Augustine. Rick Hunter and Lisa Hayes demonstrate the attributes of loyalty and honor. Rick is constantly loyal in his friendship to Minmei, as well as his loyalty to the other members of his squadron. Lisa’s honorable commitment to Rick and to her crew on board the starship is also worthy of mentioning. Together, they demonstrate virtue. Christians have long debated what kind of ethical theory best matches up with reality. Virtue ethics is the kind in which one’s character guides behavior. Here, we can see that Rick and Lisa embody a kind of virtue ethic which can serve as a model for remaining loyal and honorable even amidst temptations. Minmei’s relationship with Kyle is clearly verbally abusive. Too often, people are counseled to stay in such abusive relationships whether with the hope of “fixing” the abusive partner or due to some sense of necessity to maintain a relationship. Thankfully, Minmei leaves the abusive relationship, though it ultimately does not end with the happiest outcome, she does get herself out of a poor situation. Theologically, it should be impermissible to counsel someone to stay in an abusive relationship. I recommend this post on the difficulties with a theology that argues for staying in an abusive relationship. A powerful theme in Robotech is that of cultural conversion. Minmei’s singing ultimately brings some of the Zentraedi onto the side of the humans (whom they call “micronians”). Although at times simplistic, this portrayal resonates with some pretty deep themes. What is it about music which can resonate with us? How might we engage with culture in ways that are impactful? What can we do through music to present a winsome case for Christ? Christians have debated how conversion relates to culture and whether conversion means an abandonment of one’s own culture. Richard Twiss, for example, writes about this from the perspective of Native Americans who are followers of Christ. The power of culture to persuade is something that I think we must not lose sight of. Whether it is song, dress, or something else, cultural expressions can often be integrated into Christianity and even made sense of by Christianity. If all truth is from God, as seems to be right to affirm, then Christian engagement with the culture is a powerful tool for conversion and discussion. What? Did I just write a worldview-level post on an anime? You better believe it. I always say that every story has a worldview (a phrase that I got from Brian Godawa, though I don’t know who coined it). Robotech was no different. I recommend watching the series and seeing what kind of worldview questions you find in it. Or, if nothing else, at least you can enjoy the giant robots. Also see my other looks into television (scroll down for more). The Klingon Jesus. I’m serious. Star Trek: The Next Generation is one of my favorite TV shows. I have been watching through the series with my wife, Beth. One episode we watched recently, “Rightful Heir,” had some clear worldview-level implications. There will be SPOILERS for the episode in what follows. A plot summary can be found here. What is interesting about Data’s position is that it is effectively confirmed earlier in the series, “The Measure of a Man” (see my post on the worldview issues therein) in which Data is confirmed to be a “person.” Thus, the faith that is described here is ultimately vindicated. The definition itself–something that is outside of empirical evidence–is interesting as much for what it reveals as for what it does not. It reveals that the concept of faith here is something that is presumably in something non-physical (for it is outside of empirical evidence), but it also implicitly reveals that there can be some kind of non-physical realm, even in the Star Trek universe. Faith is not denigrated, nor is it endorsed wholeheartedly. Instead, it is something that people–even Data–have. It is a facet of a complete person. It was intriguing to me because of the religious stuff… What would happen if you could bring Jesus back? What would it do to the faith of his followers? What’s true and what’s not, what’s authentic and what’s not? 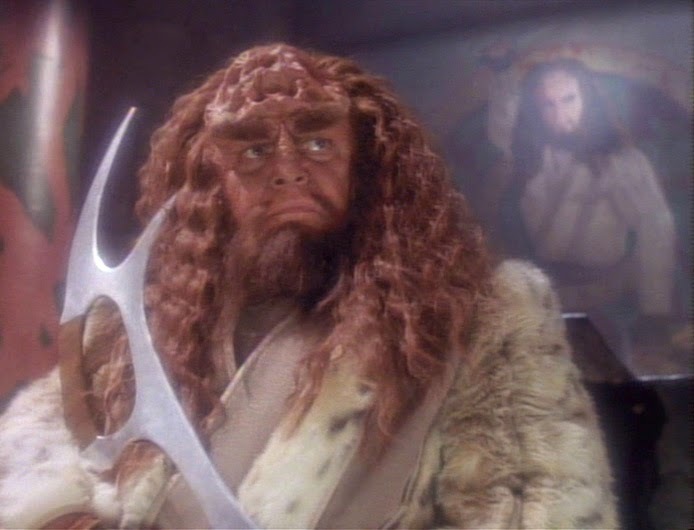 …They [the Klingons] worship [Kahless] in a literal sense. So what would bringing him back do to his people? The quote can be found in Star Trek: The Next Generation 365, a most excellent book for the Star Trek fan (like me). There are many parallels between Kahless and Jesus, but it is what is missing that is perhaps even more intriguing. Kahless is effectively just the epitome of Klingon values. His promise to return is a promise to reinstate those values. Yet Jesus Christ is not merely an example or a lawgiver. Instead, Jesus is the Incarnate God–king of the universe. Jesus sacrificed himself for us, and this isn’t just a general statement but applies to each individual. It is for my sin that Jesus died. There is no true parallel found in a figure like Kahless who is, however admirable, merely a moral example. The episode, as noted in the quotes from those involved with it above, does bring up some serious questions. What would happen if we could bring Jesus back? As one of the Klingons note, who is to say the cloning was not the way by which Kahless was meant to return? Thankfully, this will remain a complete hypothetical, because we will never have genetic material from Christ from which a clone could be made. On a deeper level, a clone is not the original thing that is cloned, but a copy. There is a true difference here. Even though Kahless received some of the memory patterns from the original, he was not the same person. Similarly, a cloned person is not the same as that from which he or she is cloned. Any different experience shapes people, and so they would not be the same person. Simply appealing to the law of identity is another way to point this out. If Kahless is not the original, then by no means could we fairly say that this clone is identical with the original. Similar? Yes. Intriguing? Certainly. Faith-shattering? No. “Rightful Heir” is an interesting episode that raises a few questions for Christians to ponder. Yet, upon thinking about it in depth, it turns out that the self-examination the episode calls for is largely surface-level. Kahless is not a true parallel for Jesus, and the question of cloning and return is answered through the concept of identity. I’d love to read your thoughts on this episode in the comments. Don’t forget to look for the worldview behind anything you read or watch! Television– read my other posts on TV and worldview (scroll down for more). Self-giving love is something that has been evidenced throughout this season of Downton Abbey, largely in the person of Phyllis Baxter. Here, she manages to save the life of Thomas Barrow because she senses something in him that suggests he will attempt suicide–something that has been somewhat anticipated all season. Jealousy is one of the most dangerous emotions, as we see throughout the Bible in narratives, wisdom, and letters. Lady Mary’s jealousy of Lady Edith’s happiness led, once again, to her visiting ruination upon that happiness. The rebuke that Tom Branson brought to Mary was well-deserved and it also shows something that we are not always comfortable with in our own lives–the need to confront sin. As the next episode shows, such a rebuke brought about change in behavior. This is a kind of demonstration of a Christian theme that is very Lutheran as well–the use of the Law to bring about change of behavior. By rebuking Mary’s self-serving attitude and calling her to better living, Branson was acting rightly. Loyalty is something that often grows with us, and Barrow’s loyalty to Downton at last comes to the forefront in this final episode. His own bitterness and cruelty got him to a point in which he felt no return, but ultimately the kindness of some saved his life. It is a wonderful story of redemption to see Barrow taking on the duties of Butler to close out the series. There were times in the series I felt nothing good could come of Barrow, but that is just what we are as sinners: grace is something that breaks through and without deserving it, God lifts us from our sin. Barrow’s story of redemption is a powerful reminder of the concept of grace. Forgiveness is another theme that has played throughout the series, and the first steps towards broader understanding and forgiveness were taken by Lady Mary and Lady Edith. Edith (at last!) has happiness, and that is at least partly due to Mary’s intervention. Mary took Branson’s rebuke to heart and made efforts to change the outcomes of her pettiness. There is little that can be said kindly about Mary, but her own story shows one in which the proud are humbled. Downton Abbey is finished. It has brought us tales of sorrow, of joy, and of grace. I hope you’ve enjoyed the journey as much as I have. I know there is a ton more to discuss, and in this post we can feel free to talk about the whole series. I’d love to read your thoughts. Be sure to let me know what you thought of the episodes, and what worldview-level issues you saw them raise, in the comments below. Mr. Mason moved into his new place, and the whole drama surrounding this shows a kind of balance of justice and pragmatism by those involved. He was effectively stripped of his place because a new owner came in and gave him the boot–despite his being tied to the land for so long. This raises many questions about justice, a sense of place, and the balance of all of these concerns. It was good to see it ending well for him, so far. Trust is something that can be lost, and it is hard to gain. A Christian perspective, I would argue, entails a kind of believing the best of others until proven otherwise. After all, isn’t that how we would like to be treated ourselves? Thomas Barrow has given others many reasons to lose their trust in him. Now that he is reaping the rewards of his own incessant sowing of discontent, he has fully come to realize just how hard it is to regain that trust. In his character, so far, we see in a way the state that all of us have been in or will be in–a state in which we must confront the fact that we have sinned, fallen short of expectations, and cannot earn our way back. Baxter has continued to be an example of grace shown to Barrow in his situation, but his own recalcitrance on accepting her grace shows, perhaps, how far he has fallen. The question is: Will he be able to come back? Finally, we are left wondering about the relationship of Lady Edith and Lady Mary. When will they ever come to terms? Is it possible that they will? Again we see the impact of broken trust on a relationship. I’m hopeful that grace can make its appearance here as well.